No need to wait until Thanksgiving to make an open face sandwich! This easy and quick version is perfect for using Rotisserie Chicken! You can pull a warm meal together in just a few minutes! There are many ingredients you could add into this to put your own spin on it, but I tend to keep it simple, and just to the basics. Feel free to play it up a little! Make stuffing mix according to package directions. Make turkey gravy if not already prepared and heat till warm. Place 2 slices of bread on each serving plate. Layer each bread with warm chicken. 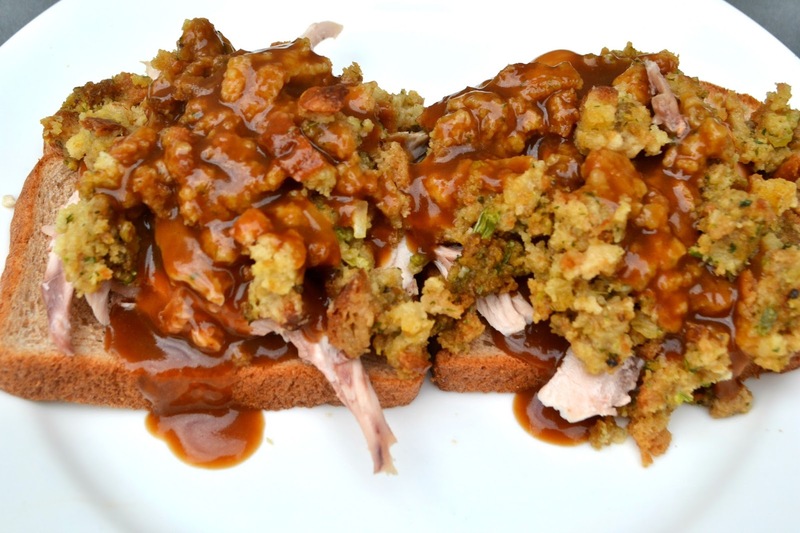 Top each bread/chicken with 1 cup stuffing. Drizzle desired amount of gravy over top. Serve with a side of green beans or other veggie.